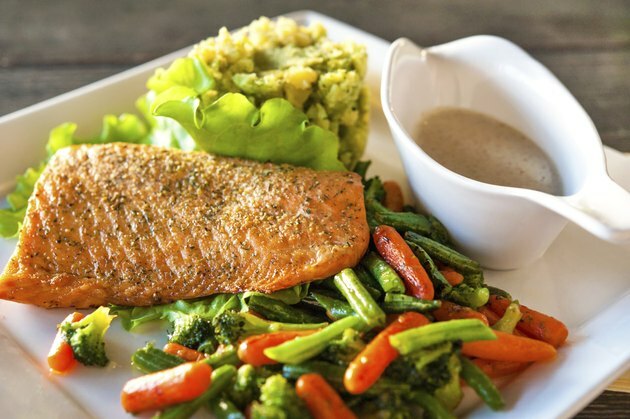 Trout can be enjoyed as a healthy meal that is rich in protein, vitamin D, omega 3 oils, selenium and magnesium but low in calories, polyunsaturated fats and saturated fats. Baking trout isn't difficult and is an excellent way to retain the flavor and healthy qualities of the fish. If you aren't an angler, you can purchase fresh trout at your local market. Bake your trout as soon as possible, as the fish can quickly acquire an unpleasant odor and flavor that may ruin a meal. Clean the trout, if necessary. Rinse the trout with cool water inside and out. You can choose to leave the trout whole, or you can use a sharp knife to cut off the head just under the top fin. The decision whether or not to remove the head is a matter of personal preference. Some people prefer to bake trout without the head, while others believe that baked trout retains its shape better with the head on. Preheat your oven to 450 degrees Fahrenheit. Trout is best when cooked at a high temperature for a fairly short time. Place a piece of heavy-duty aluminum foil in a large baking dish. The aluminum foil needs to be large enough to be folded back over the fish. Coat the aluminum foil with a thin layer of olive oil, cooking oil or melted butter. Cut a fresh lemon into thin slices and place approximately half of the lemon slices evenly into the bottom of the pan on top of the foil; place the trout on top of the lemon slices. Sprinkle the inside of the trout with salt and freshly ground black pepper. Add additional seasonings if desired, such as paprika, garlic, lemon pepper, or sprigs of fresh rosemary, tarragon or dill. Also add two or three lemon slices to the inside of the fish. Bake the trout for 10 minutes, then unfold the packet far enough to check the doneness. When done, trout is moist and flaky with an opaque appearance. Return the fish to the oven and continue baking if necessary. Trout usually cooks within 20 minutes, but may require up to 30 minutes, depending on the size of the fish. Serve the fish hot from the oven. Garnish the fish with sprigs of rosemary or parsley, and include a few lemon slices on the side.